Following a brutal attack by her ex-boyfriend, Kate Priddy makes an uncharacteristically bold decision after her cousin, Corbin Dell, suggests a temporary apartment swap – and she moves from London to Boston. But soon after her arrival Kate makes a shocking discovery: Corbin’s next-door neighbour, a young woman named Audrey Marshall, has been murdered. When the police begin asking questions about Corbin’s relationship with Audrey, and his neighbours come forward with their own suspicions, a shaken Kate has few answers, and many questions of her own. Jetlagged and emotionally unstable, her imagination playing out her every fear, Kate can barely trust herself. so how can she trust any of the strangers she’s just met? Out on January 12th, click HERE to order your copy! So, Her Every Fear. I so badly wanted to love this book. I really did. I mean, The Kind Worth Killing, that one made my top reads of 2015 so I guess I had high expectations for this one. Sadly though, this one didn’t fully deliver for me. Which is odd, because I don’t doubt its a good book! It’s got a really interesting premise and some genuinely suspenseful bits and pieces, yet I’m still left wanting. I have read all 3 of Peter Swanson’s books now, so I’m kind of familiar with his writing. Characters, I think, is where he excels in his books. He creates characters that you love to hate, or just love depending on your taste. In Her Every Fear there is another eclectic mix of characters too. Kate, anxiety-ridden and seeking a life away from reminders of her past, and Corbin, a semi All-American jock of sorts. The focus is very much on these two, with peripheral characters dotted in throughout the story too. I’m not going to lie though, I didn’t get on too well with my namesake (Kate, in case you were wondering!). I think there was just something about her, I can’t put my finger on it, but I didn’t warm to her. As I said above, the premise is an interesting one. 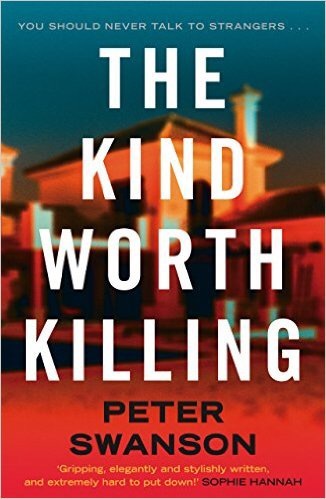 Not least because moving to a new country via house-swapping is interesting, but to find yourself inadvertently involved in a murder investigation adds a new level to an already scary prospect, especially for someone as emotionally unstable as Kate. I really enjoyed certain parts of this book, but others got a bit repetitive at times (different POV for the same thing) which was a little frustrating. On the whole, this is a decent read. It didn’t suit me personally, but at the same time I still think if you enjoy crime/mystery thrillers then this is one to add to your list!